Hollywood writer and actress. Six movie roles per year in the Roaring Twenties. Touted as The Most Beautiful Girl in the World, capital letters. That's one way to find yourself on a trading card. Those winsome eyes belong to Hollywood's silent film star Barbara LaMarr. 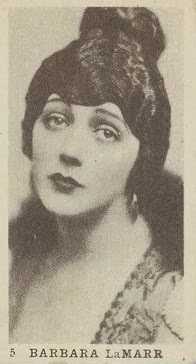 First employed as a writer and soon encouraged to perform, she burned through silver screen stardom in just six years (1920-25). Her candle-burning schedule included almost no sleep, at least one drug habit, five marriages, and death by tuberculosis at age 29, one of the hardest of hard-lived starlet lives. 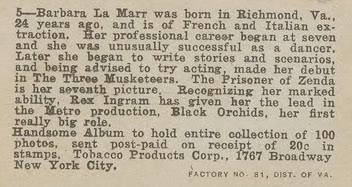 A decade later, actress Hedy Lamarr "inherited" her screen name from this La Marr via studio head Louis B. Mayer, who considered Barbara one of his favorites. 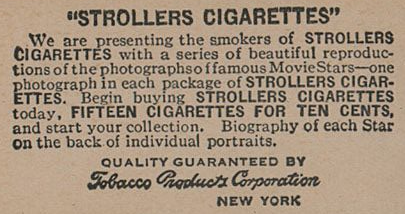 Some T85 backs show a Strollers Tobacco ad instead of the personal bio. I'm not certain if all subjects have multiple backs or certain cards always show the ad instead of a bio; this might vary by type of issue. A terrific 1922 T85 gallery supplied my #5 scans and includes luminaries like Gloria Swanson, Rodolph (Rudolph) Valentino, Jackie Coogan, Norma Talmadge, Charlie Chaplin, Buster Keaton, and Lionel Barrymore. It's a who's-who of early Hollywoodland and the set's a great one for movie fans to attempt, in any of its three permutations: Type 1 (100 cards, sepia), Type 2 (220 cards, black-and-white, numbered), or Type 3 (220 cards, oval portrait). 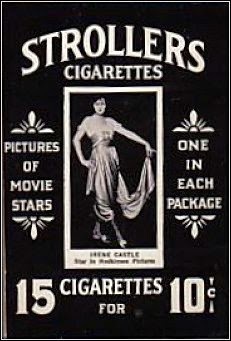 Per the full checklist, #201-220 are labeled "© Mack Sennett" and don't identify the actresses shown. 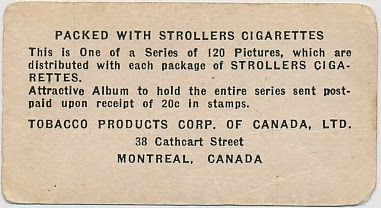 Strollers also marketed this series via the Montreal-based Tobacco Products Corp. and collectors catalog it as C142 ("Strollers Canada"). Value: Non-sport type cards cost a lot less than 1920s tobacco equivalents and this #5 can be had for $10 or less in low-grade. Fakes / reprints: Don't know the non-sports market well enough to say for sure, but I imagine the set's most famous names might have been reprinted or faked. I doubt that a lesser start like La Marr would be vulnerable to it.